Contact person: Associate Professor Thomas Lingefjärd, phone: +46 (0)31 786 2253. Dr. Thomas Lingefjärd is Associate Professor in the Didactics of Mathematics. In February 2011, he participated in the Second Meeting of the Indo-Swedish Working Group on Mathematics Education in Mumbai, a conference organised by the National Center for Mathematics Education (NCM) at University of Gothenburg, and hosted by the Tata Institute of Fundamental Research in Mumbai. Read an article about the Indo-Swedish collaboration and the 2011 conference (only in Swedish). 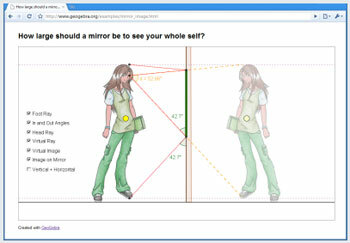 Inspired by this existing Indo-Swedish collaboration on Mathematics Education, Dr. Lingefjärd initiated a new project, a comparative study focusing on 7th and 9th grade students in Sweden and India doing constructional work and solving problems in Geometry with GeoGebra, a free and multi-platform dynamic mathematics software for all levels of education that joins geometry, algebra, tables, graphing, statistics and calculus in one easy-to-use package (more information about GeoGebra). Research studies were carried out during the fall 2011 in western Sweden (around Gothenburg), in Mumbai and Delhi. The results were then presented at the 12th International Congress on Mathematical Education (ICME-12), held in Seoul, South Korea, 8–15 July 2012.